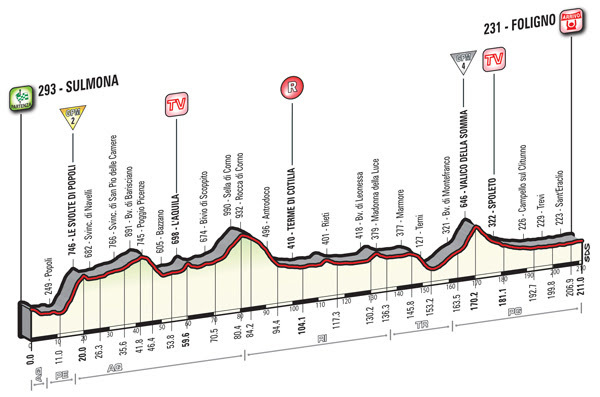 Stage 7 of the Giro d’Italia, Sulmona to Foligno (211km): a hilly stage that may still end in a bunch sprint. Cheered by huge crowds, the Corsa Rosa has been truly celebrated in style this morning. The group, 191 riders strong, passed km 0 at 11.54. Did not start: dossard nr 97, Lawrence Warbasse. Sulmona: Sun, 21°C. Wind: moderate – 27kmh. Foligno (approx. 17.15 – Finish): Scattered showers, 17°C. Wind: strong – 31kmh. The stage is wavy, with a first climb starting just 11km after the start (Le Svolte di Popoli), followed by nearly 200km on wide and mostly straight roads, with roundabouts, speed bumps and traffic islands being the main obstacles typically found in urban areas (such as L’Aquila, Rieti, Terni, Spoleto). The final part of the route descends (or runs flat) all the way up to the final kilometres. The final kilometres are quite uncomplicated, up to 2,000m from the finish. Here, one right-hand bend quickly followed by two left-hand bends lead into the home stretch with 1,300m left to go. There is just one last, gentle bend 500m before the finish line, which lies on a 160m long and 7m wide asphalt straight.